In 1822 Capt. John Cleves Symmes petitioned the US Congress for funds to mount an expedition to the North Pole, where he believed they would find an opening leading to the center of the Earth. The politicians never approved the expenditure, leaving writers and poets to speculate on the existence of the Hollow World. It wasn’t until 1899 when famed adventurer and philanthropist Emery Trent made the first documented excursion to the Earth’s core. 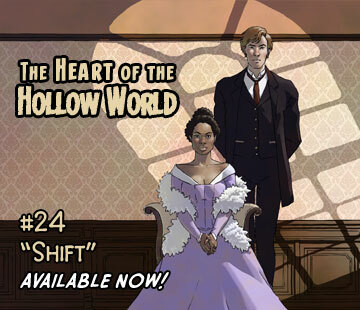 Now the Hollow World is a travel destination unlike any other. Where else do cave men still hunt the mighty Diplodocus while giant robots engage in epic battles with Tyrannosaurus Rex? The World inside our world is timeless not simply because beasts long extinct on the surface continue to roam the jungles of its core, but because time itself is meaningless in a place where there is no natural way to measure it. The small inner sun hangs motionless in the center of the sphere making it always daytime, always noon. The first thing you are likely to notice when you walk the moss covered fields of the Hollow World is the horizon. It doesn’t exit. The landscape slopes gently upward until it is lost in the haze of the inner atmosphere. By the early part of the twentieth century volcanic activity had sealed both polar openings. Robert Peary found no evidence of one when he reached the North Pole in April of 1908, and the passage at the South Pole had been sealed for over a century when Roald Amundsen got there in 1911. Today the only effective passage to center of the Earth is via drilling machine. The relative scarcity of these devices means the heart of the Hollow World remains unspoiled. If you do find your way down there, please leave a clean camp. Touring the Hollow World is for serious adventurers only. Travel at your own risk. Ashfire Moon assumes no responsibility for loss of life or limbs. Also, if you happen to find Emery Trent still alive down there please inform him the solicitors managing his family fortune desperately need a word with him. Beautiful work from the legendary Doug Lefler. Glad to see him take time from storyboarding features to create narrative art we can savor first hand. “Sentry” and “Setting Boundaries” are highlights. The graphic design, yet representational rendering of Sentry is a wonderful example of beauty in simplicity. Well said!, I completely agree with your opinions Brian. So glad to know this project is continuing; when it stopped updating on the scrollon site proper, back around, what. #14?…I thought it had been killed! It’s still alive, here and on scrollon.com, but the drawing of the chapters get more complex as I near the climax, and it takes me longer to draw each one. Thanks for sticking with me. There will be 24 chapters to complete the current story. I am now inking chapter 21. War is coming!